At 1st glance When you get there you notice an ample parking lot and, for an area one would not usually associate with lots of traffic, it was actually quite full and even had a line-up. There is seating everywhere and a sea of people. 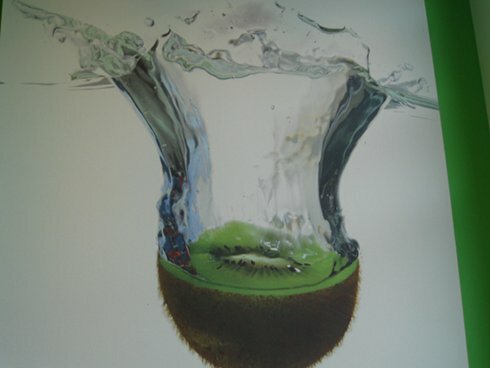 The interior is quite bright and well lit, with large images of fruits which add that dash of colour on a white background. There aren’t too many private booths since they kind of maximized space for capacity. I love how they were creative with the naming of sections in their menu. They somehow manage to work the word egg in each section, like Eggsxalte and Eggsplorateurs, to name a few. 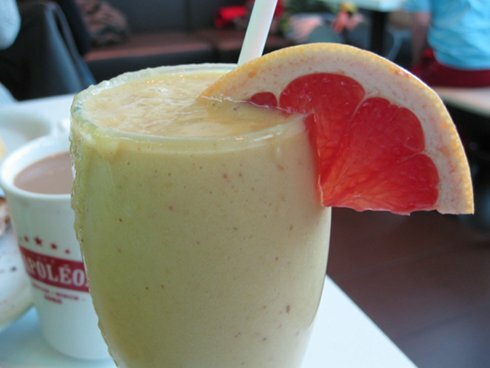 We started off with a smoothie and chose the Somptueux($3.95) ; this was a banana-heavy smoothie which hit the spot. It had a pronounced banana taste, but in a good way, and if you consider the price, for $3.95 that’s actually a really good deal since other places will usually cost more..
Next came my friend’s two-eggdish ($5.25) . 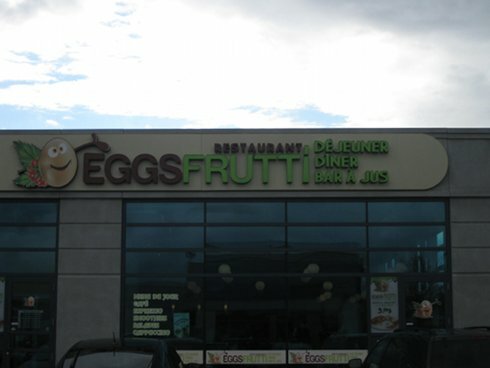 She had two poached eggs which came with some fruit. 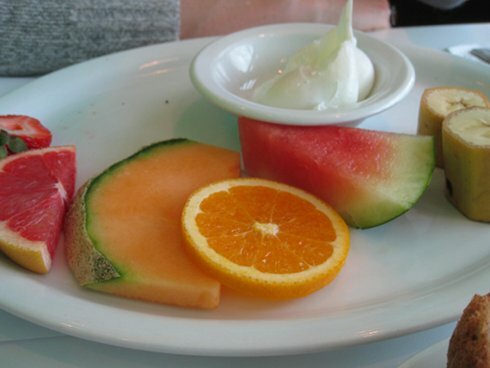 Though there were six types of fruit, the plate still seemed kind of bare. I know that the price wasn’t much and it did include coffee, but I just would have liked to see a little more food and less empty plate. 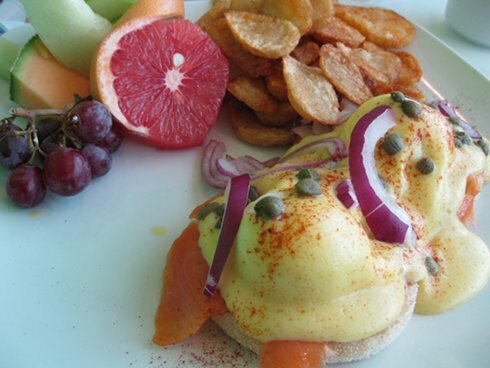 Lastly came my dish, the Smoked Salmon Benedict ($11.95). This dish came with coffee and free refills, and the plate had fruit and potatoes. The fruit slices were thick and there was a decent amount of potatoes. They also did little things to the fruit to flower up its presentation, like curling the orange peel. Overall, the smoked salmon was fair, the hollandaise sauce did not overtake the dish, and for the price it’s pretty decent considering it came with potatoes and coffee. This dish is not revolutionary but the price is good, and you are full at the end. Our service was decent; we didn’t have too much interaction with our waitress since we knew what we wanted. Our coffee refills came rather frequently so we were satisfied on that front. The menu is so large and varied that it offers a lot of options that do not contain meat. I didn’t see any vegan options on the menu so maybe you will have to go for some fruit-only options. The area itself is random but it fills up; the ample parking helps, and the large seating area ensures that you will not wait long to get a spot even if it’s full. The prices are very fair and our dishes came with coffee. The menu items are not the fanciest, but if you want a classic breakfast for a reasonable price then this is a place you can add to your list.